Hitachi CP-AW2519N Ultra Short Throw Projector an interactive projector for educational and corporate use. It can project an 80-inch image from a distance of 22 inches. 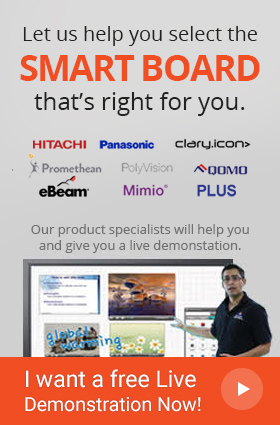 It comes with Hitachi Starboard software that enables content interaction in real time. With Hitachi CP-AW2519N short throw projector, any static wall or even a chalkboard can be transformed into an interactive surface. The interactive pen can be used to write or annotate content. The IR sensor and Ultra Sonic technology enables seamless pen interaction. With 2500 ANSI Lumens brightness and a contrast ratio of 2000:1 the visuals are sharp and vivid. For educational purposes, the Starboard software allows use of clipart, mathematical, geography and science tools. Additionally, use of documents like Microsoft Word, Excel and PowerPoint is also supported. Annotated images can be exported in a variety of formats like JPEG, PNG, PDF, BMP and HTML. Using the optional table stand with this ultra short throw projector, a 60" image can be projected onto a tabletop. Hitachi CP-AW2519N also includes Perfect Fit 2 (PF2); a feature that helps repair digital image distortions quickly and easily.